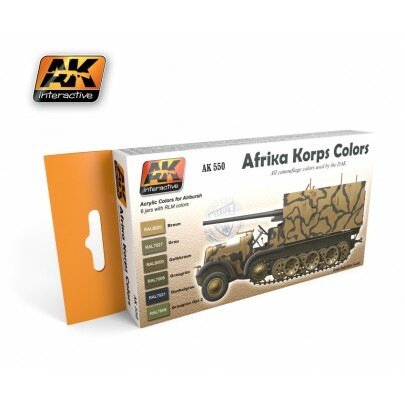 The Deutsche Afrika Korps vehicles wore four different RAL colors: 8000 and 7008 until March of 1942 and RAL colors 8020 and 7008 after March of 1942. Additionally, the vehicles were painted with a Panzer Grey RAL 7021 base that in many cases was exposed when the paint camo was chipped and worn away. Finally, there is a discussion about the color of theTiger I deployed in Tunisia, because some sources identified them as Olive Drab. However, recent research identified the paint as RAL 8020 but in a more greenish shade than usual. This set presents 6 colors to apply directly to your model without the need to make complex paint mixtures or hours of deep research about the colors used by the DAK. Additionally, these new colors are suitably modified to compensate for the scale effect in models. These are accurate and real colors for lovers of precise paint. Afrika Korps Color Set The Deutsche Afrika Korps vehicles wore four different RAL colors: 8000 and 7008 until March of 1942 and RAL colors 8020 and 7008 after March of 1942. Additionally, the vehicles were painted with a Panzer Grey RAL 7021 base that in many cases was exposed when the paint camo was chipped and worn away. Finally, there is a discussion about the color of theTiger I deployed in Tunisia, because some sources identified them as Olive Drab. However, recent research identified the paint as RAL 8020 but in a more greenish shade than usual. 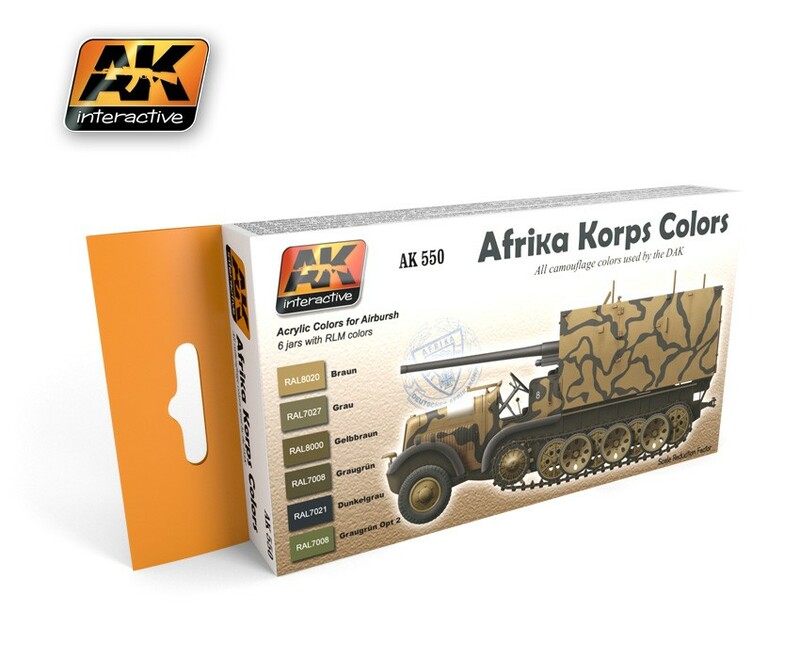 This set presents 6 colors to apply directly to your model without the need to make complex paint mixtures or hours of deep research about the colors used by the DAK. Additionally, these new colors are suitably modified to compensate for the scale effect in models. These are accurate and real colors for lovers of precise paint.